Pastor Hill was born in Watsonville, California, and grew up in Charlotte, North Carolina. 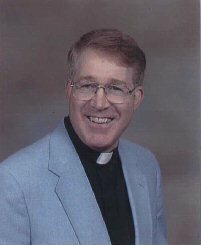 Attending Synodical schools in Concordia, Missouri, Fort Wayne, Indiana, and Springfield, Illinois, he earned a Master of Divinity from Concordia Theological Seminary in 1976. Beginning ministry in 1971 serving the Southeastern District as Missionary-at-Large in Goldsboro, North Carolina, Pastor Hill became the first resident pastor of Peace Lutheran Church there. Entering active duty with the United States Army Chaplains Corps in 1978, Chaplain Hill served in Monterey, California, Bad Kissingen and Mannheim, Germany, Fort Ritchie and Walter Reed Army Medical Center in Maryland, and Newport News, Virginia. Retiring in 1995 from the Chaplaincy, Pastor Hill performed youth ministries as Associate Pastor at The Lutheran Church of Saint Andrew, Silver Spring, Maryland. Thanksgiving weekend of 1997 Pastor Hill was installed as Pastor of Messiah Lutheran Church in Germantown. Pastor married Anne Patricia Buehrle of Wheaton, Maryland, and their three grown children are living in the area. Tabitha lives in Gaithersburg with her husband, Ed and their sons. Robert lives in Frederick with his wife, Lisa and their three sons. Jonathan lives in Columbia.